How would you characterize the personality of a beer? A good many people would consider the social conditions under which a beer is consumed and come up with descriptions such as amiable, friendly, congenial and maybe even brotherly. Generally this would be true, but under certain unfortunate circumstances the adjective might be deadly. Throughout history there have been occasions when events conspired to put beer at the center of disturbances. These were not barroom brawls in which beer inflamed the spirit of the combatants, it was more of a subject and a cause. How? To fathom the cultural significance of beer drinking it's necessary to understand its relationship with the development of a community. The most important early change in social structure was when mankind evolved from a nomadic hunter-gatherer to a group settled in an agricultural society. Some historians claim this came about because our ancestors wanted to produce the raw ingredients for beer. The corresponding formation of towns brought with it civic problems the inhabitants were ill equipped to deal with. Among these was pollution. Wherever these villages were founded the rivers and streams soon became fouled with refuse and the waterborne pathogens which made the populace ill. But those who drank beer were spared these ravages and so beer became a vital part of daily life. So much that it was nearly as natural to drink beer as breathe. No wonder from earliest times a shortage of beer would cause discontent among an area's inhabitants. Modern instances of beer related disturbances can be found in Europe where more than anywhere else beer was inextricably intertwined with daily routine. In England there is the story of the conflict between the Jacobites, supporters of James II and those who championed the house of Hanover. The loyalists to the Hanoverian cause organized themselves into loose associations which gathered at Taverns and became known as Mug-house clubs. On October 31, 1715 both groups made the mistake of occupying the same ale-house. A confrontation occurred, fighting erupted and soon spilled out into the streets. In the days which followed there was a series of violent street brawls which thereafter became known as the Mug-house riots. In Germany too, beer led to organized conflict. 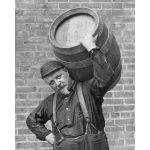 In the 1840's (a time of great civil and social strife in the Germanic countries) a small number of brewers had gained a position of great influence. In an attempt to control the market, they engaged in what is now called price-fixing. Frequently between the years of 1844 and 1910 the masses rebelled against attempts at price control with what were called the beer riots. But perhaps the worst occurred in Munich on 18 October 1848 when the brewers raised the cost of beer by one penny. This was considered such outrageous gouging that a mob of angry protestors organized and marched upon the Spaten brewery. There they encountered an equally determined military blocking the entrances. Unfortunately, neither side would back down and several fatalities were recorded as a result of the fighting which followed. Even recent history has its examples. In mid-1995 a neighborhood group in Munich attempted to regulate the hours of that city's famous beer gardens. The government was ill-prepared for the resolve of more than 20,000 marching protestors who bore a petition exceeding two hundred thousand signatures. All that is great in Europe but nothing of the sort could happen in the United States. Actually it did. The most well known of these disturbances were the Boston Massacre and the Boston Tea Party, but in both of these Beer was used as an agent to embolden the crowd; it was not the cause of the violence. However there was an occasion when beer was the agent of conflict and it happened in the Windy City. Of course because it was Chicago there were unavoidable political overtones. Through the middle to late eighteen hundreds the discontented of Ireland aligned themselves with the Germans against the English. This alliance was so strong it even extended as far as Chicago and there a group who hated anything to do with foreign culture was about to come to power. The Know-Nothings, an ultra-conservative "Americans only" group, managed to ride a surge of ethnic bias to power. So it was that their candidate, Dr. Levi Boone, came to the Mayor's seat. Boone had a bone to pick with the Germans; he resented the manner in which they had formed their own neighborhoods, churches, trade unions and even theater. This was all too foreign for him to bear and he considered beer drinking as one of those evils uniquely German and definitely un-American. Boone was further exacerbated by their alliance with the Irish, a group looked down upon throughout the country. Taking it as a personal challenge he set out to right this alien wrong and harm both groups as much as possible. The weapon he chose was beer. In a move calculated to strike at biased conceptions about both groups he increased liquor license fees by 600 per cent and coupled this with a three month moratorium on issuing licenses. Next he ordered reenactment of an old law prohibiting alcohol and beer sales on Sunday. There was no doubt who Boone was targeting; it was all those small taverns located on the North Side of town where the Germans lived near their beloved breweries and close to their Irish allies. On the first Sunday of enforcement the German inhabitants went about business as usual, or so they thought, until the police arrived and more than two hundred German beer drinkers were arrested. A hearing on the matter was set for April 21, 1855. As the trial date dawned a crowd of 300 barkeepers approached Courthouse Square complete with fife and drum and threats directed at the judge. Proceeding to Randolph and Clark streets the column was headed off by the police and forced back toward the North Side. Though incensed, the crowd backed off without a fight; confrontation had been avoided, temporarily. Later, about three o'clock in the afternoon, the protestors returned. As the mob approached the police were once again prepared. After about half the crowd had crossed the river they opened the draw bridge and split the opposition forces. This only further ignited the crowd and it was then the police learned the north side'ers had armed themselves. Firing broke out and both sides suffered wounded. As night fell things quieted but the beer lovers had made their point and Boone eased his campaign of hatred. Though the cost of the fighting was heavy, the ethnic neighborhoods were able to return to the now seemingly "All American" practice of a Sunday afternoon beer. In fate's curious way, the north side of Chicago would become one of the more desirable residential sections of the city and various aspects of the north side'ers culture would become celebrated fixtures in Chicago society. More important was the long range effect of what became known as the "Chicago Lager Beer Riots". Essentially the disturbance successfully discredited the Know-Nothing party which faded from both the national and Windy city's political scene. It also solidified Chicago's reputation as one of the great beer cities in America. Great enough to fight for their brew. Gregg Smith reserves all rights that pertain to the text of his articles, in any form that it appears.